According to Audrey Mae’s artistic map diagram and gravestone numbering system, Anna Maria (“Mirah”) Spencer is Gravestone Number Eight. Audrey Mae always heard her grandmother Anna Maria’s name pronounced as Anna Mar-eye-ah. Because of this, Audrey Mae wrote her grandmother’s name as Anna Mirah.Anna Maria (“Mirah”) Spencer and spouse John Johnson Spencer, a veteran of the Civil War, share the same large gravestone. Anna Maria and John Johnson Spencer are Audrey Mae’s, John Edward’s and Edith Anna’s grandparents. 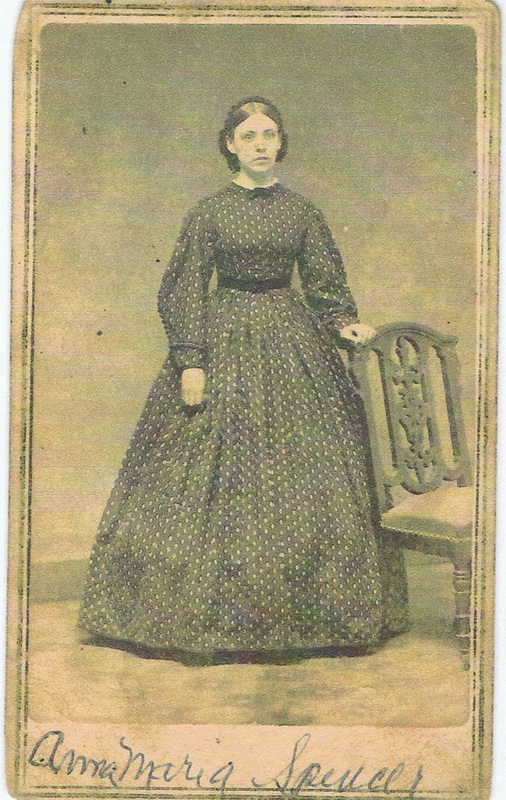 Anna Maria (“Mirah”) –pronounced Mar-eye-ah– Spencer was the daughter of Richard Anthony and Ann Almy (née Tarbox) Spencer. Richard Anthony Spencer left one child, Anna Maria (pronounced Mar-eye-ah). The child had just turned one year old when her father died. She was raised in East Greenwich with the extended Spencer family, her paternal grandparents, Roby and Richard Anthony (“Deacon”), and her father’s sister, Audra Eleanor. Anna Maria and her father’s younger sister, Esther Amanda (“Aunt Mandy”), grew up like sisters as they were only eight years apart. Although both Anna Maria’s parents’ birthplace was East Greenwich, Rhode Island, Anna Maria (pronounced Mar-eye-ah)’s birthplace was Versailles, Connecticut. Historical records have Richard Anthony marrying, living and dying in New York City, but Audrey Mae knew nothing about his travel to New York or his death at such a young age. Audrey Mae’s oral tradition was that Ann Almy was a “high flyer” and she couldn’t be bothered with raising children. Richard Anthony and his daughter, Anna Maria (pronounced Mar-eye-ah) are buried in the Spencer Family Cemetery (aka E.G.No.9) on Middle Road. Richard Anthony’s wife, Ann Almy (née Tarbox) is not buried in the Spencer family cemetery. Audrey Mae always pronounced her grandmother Anna Maria’s name as Anna Mar-eye-ah, and spelled her name, Anna Mirah. John Johnson Spencer’s pension papers have the spelling of Anna Maria as Anna Myriah. (An outside explanation of the Maria spelling and pronunciation as Mar-eye-ah can be found in the book, Play It As It Lays by Joan Didion. Maria was pronounced Mar-eye-ah in England at that time in history.) The author of this website had promised Audrey Mae that whenever she keyed in the name Anna Maria, she would always explain to pronounce Maria as Mar-eye-ah. Audrey Mae having heard her grandmother’s name many, many times was really concerned that the descendants know the correct pronunciation of her grandmother’s name. “I always heard the name pronounced Mar-eye-ah” said Audrey Mae in her late eighties, “I never heard it pronounced differently”. “The spelling on the gravestones were not always correct. This must be wrong.” “Are you sure the spelling on the stone is correct?…” continued Audrey Mae. The author of this website has cheerfully kept her promise to always key in the pronunciation of Maria as Mar-eye-ah. 🙂 [Another source has Maria pronounced Mariah]. 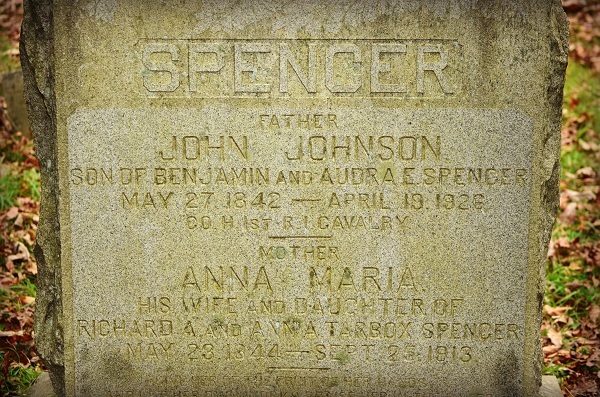 Audrey Mae’s mini-biography of Anna Maria and John Johnson Spencer had a connecting line and letter “M” (for marriage) attached to show that both husband and wife are buried in the Spencer Family Historical Cemetery. Even though Anna Maria (pronounce Mar-eye-ah) died thirteen years before her spouse, the couple share one large gravestone. 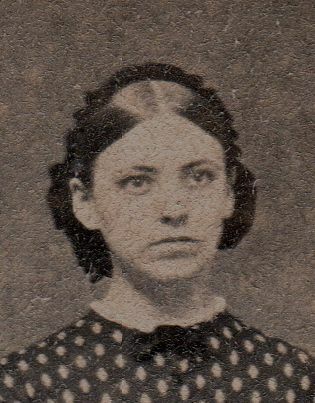 Anna Maria was married to John Johnson Spencer, on August 13, 1871, by Reverend George Northrop in Exeter, Rhode Island. Anna Maria and John Johnson had three sons, Richard Augustus, William Joseph Briggs (aka William J.B.) and Alfred Ernest Spencer. 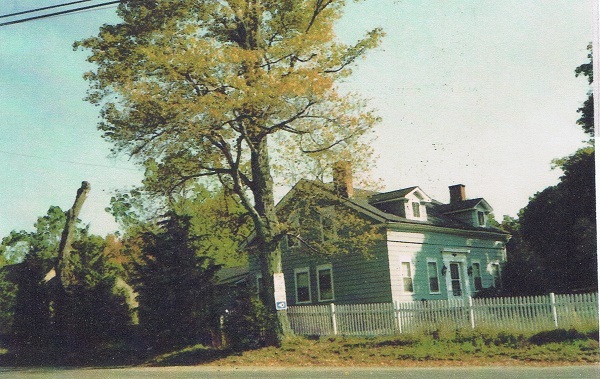 John and Anna Maria raised their sons at the Spencer house on Spencer’s Corner (Division, Crompton and Shippeetown Road intersection) with one exception. Their middle son, William J.B. Spencer, at age twelve, was sent to live with the family of his great-uncle William Augustus (“Gus”) Spencer. He would work the farm with his uncle and thereby inherit the farm or homestead as the Spencer descendants called the land. William J. B.’s children, Edith Anna, John Edward and Audrey Mae, would then be born and raised on this farmland until Audrey Mae was twelve and her father sold the farm and the family moved to Coventry, Rhode Island in 1922. Another interesting and somewhat amusing tale about the early life influences on William J.B.: Anna Maria’s biological mother Ann Almy’s second husband was Joseph Briggs. He paid his stepdaughter, Anna Maria (pronounced Mar-eye-ah) $50.00 if she would name one of her sons after him. She named her second son, William Joseph Briggs Spencer. 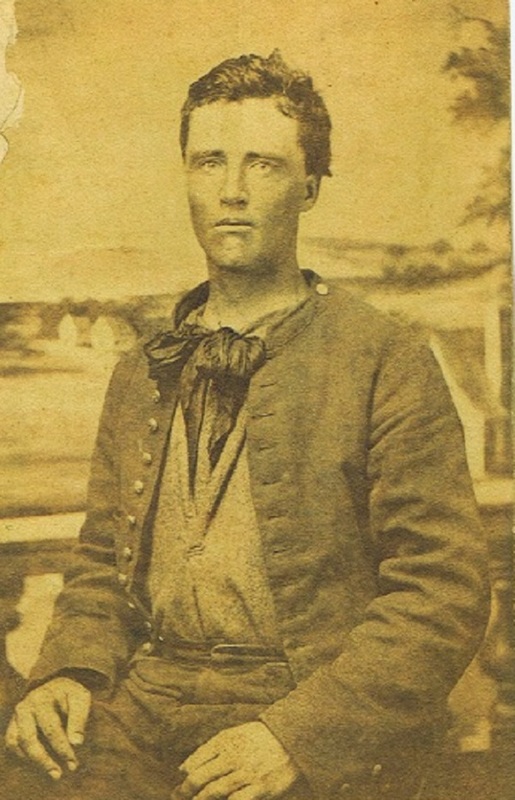 This son, the great, great grandson of John and great-grandson of Richard Anthony (“Deacon”) and grandson of Richard Anthony and son of John Johnson Spencer, has Joseph Briggs’ name but is no blood relation to Joseph Briggs. 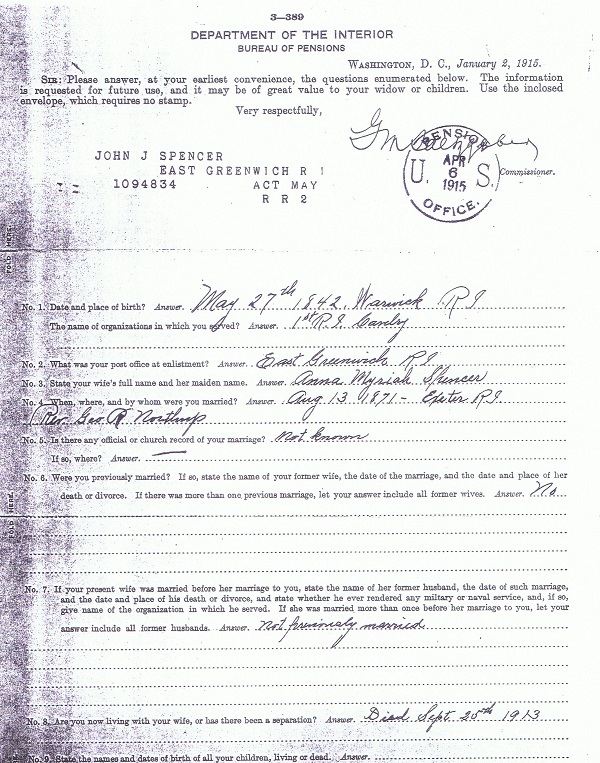 During his lifetime, William, the father of John Edward, Edith Anna, and Audrey Mae, always signed his name as William J.B. Spencer. William J.B’s older brother is named Richard Augustus, after his grandfather and great grandfather (Richard Anthony) and perhaps after his uncle Augustus who was called “Gus”. William J.B. is named after his great, great, great grandfather, William, who is buried in the Over-back cemetery (see straightspencerhistoricalcemetery.org). Web site author does not know who William J.B.’s younger brother is named after as Alfred Ernest is not in Audrey Mae’s direct line ancestry. If Anna Maria (pronounce Mar-eye-ah) had not married a Spencer, the Spencer name would have ended with this generational Spencer line because Anna Maria’s father, Richard Anthony, died at age twenty-seven and left no other heirs beside Anna Maria (pronounced Mar-eye-ah). Anna Maria Spencer and spouse John Johnson Spencer have the same large gravestone, Gravestone Number Eight, in Audrey Mae’s map diagram and her gravestone numbering system in her ancestral cemetery, the Spencer Family Cemetery on Middle Road. Following is a newspaper article of Audrey Mae’s paternal grandmother’s death in 1913. An amusing observation is the misspelling of Obituary. The “R” is left out! For those who are not New Englanders or who do not have a sense of history, that is how the New Englanders spoke, particularly before the radio, television –never mind computer– age. They put in the “R” where it didn’t belong and took out the “R” where it did belong. Example was President Kennedy pronouncing Cuba as Cuber. The author of this website remembers being confused as a child because her friend in elementary school was called Linder but spelled Linda. The website author is Heather but pronounced Heathah. When the author was in college in the Philadelphia, Pa. area, there were two Heathers in her dorm. One was from Philadelphia and the author from Rhode Island, So the students would amusingly call her “Heather” and call me “Heathah”. Audrey Mae told of her older sister, Edith Anna being very attached to her grandmother Anna Maria. Today (2013) one of Edith Anna’s great granddaughters has the middle name of Anna. She is named after her great grandmother and her great, great, great grandmother. This thirteenth generation Spencer in America is Melissa Anna who was born and raised in California–3,000 miles from colonial Rhode Island Spencer homesteads. This entry was posted in All Gravestones, Audrey Mae's direct ancestors, Born into the Spencer line, on November 29, 2012 by Heather.